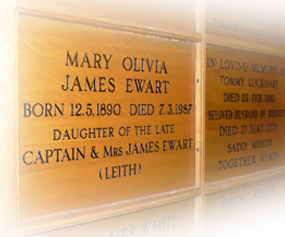 The wood panels are located in the lower memorial area which is underneath the Lorimer Chapel.PLEASE NOTE ACCESS TO THIS AREA IS VIA AN EXTERNAL STAIRCASE AND THERE IS NO WHEELCHAIR ACCESS. A photograph, a flower or a card may be attached to the panel, provided it does not encroach on other panels and is attached in such a way that it does not damage the panel. Any items which do encroach onto other panels will be removed. The lease of the panel is for 10 or 25 years and you can renew this at the end of the period. The panel can accommodate up to eight lines of inscription. It is possible to leave space for an inscription to be added in the future.